We’d love your help. Let us know what’s wrong with this preview of Nothing Is Strange by Mike Russell. To ask other readers questions about Nothing Is Strange, please sign up. If nothing is strange, what is normal? Should there be a book called Everything is Normal? Nothing is Strange is the first collection of short stories by Mike Russell. I'm thrilled to have the opportunity to read this weird and wonderful collection after having enjoyed his work in Strange Medicine. In this collection, we get to see a wider variety of his style with twenty stories. I liked all of the stories featured here, but my favorites are "The Warehouse", "The Meeting", "Barry and the I received a free copy of this paperback book from Strange Books in exchange for an honest review. I picked up this absolute gem of a little book yesterday afternoon and sort of just floated through it, in a good way. There are twenty stories in this small book, obviously very short (it's only 144 pages long) but definitely powerful. What I discovered is that while reading, I could actually visualize the author's bizarre characters and settings in my head and it was sort of like walking through a gallery of surrealist paintings. That's the best way I can describe it -- I wasn't blessed with t I picked up this absolute gem of a little book yesterday afternoon and sort of just floated through it, in a good way. There are twenty stories in this small book, obviously very short (it's only 144 pages long) but definitely powerful. What I discovered is that while reading, I could actually visualize the author's bizarre characters and settings in my head and it was sort of like walking through a gallery of surrealist paintings. That's the best way I can describe it -- I wasn't blessed with the gift of eloquence in my writing (as I'm so fond of saying, I'm a reader, not a writer), so that image will just have to do. I will say that this is not a book for everyone, for example, it probably wouldn't appeal to readers who have to have things spelled out, explained, etc., since that doesn't really happen here. This is a book for people who enjoy a good think. Its elegance lies in its simplicity, and its simplicity belies its complexity. It is dark, definitely designed for people who want something different in their reading; it's also one of those books I appreciate for its ability to go outside the box and push my own reading boundaries outside of the norm. It is beyond cool, well beyond ordinary, and just so what I needed right now. for more, I've posted about it at my online reading journal. I enjoyed this! It was a really quick, quirky read; I was so immersed in it that I actually didn’t realize there were 20 stories until looking back on the synopsis after I read it. It seems crazy to think about there being that many now because the whole thing just flew by. Of the 20, my favourites were The Miracle, Barry & the Triplets, Lesley Visits the Barbers, and The Living Crown. If I had to choose my top one, I would say The Living Crown-it touched upon free will which really grabbed my attention. Well that was some mighty fine false advertising, it says on the cover that "Nothing is Strange" that is complete hooey! Everything in this book is strange, I really need to start reading the back of books before I start them, just to give myself a bit of warning for what I'm getting myself into. The stories are wonderful, some of the most bizarre things I've ever read, I've no idea what kind of mad man Mike Russell is, but he has to be pretty crazy to come up with these stories. Each story star Well that was some mighty fine false advertising, it says on the cover that "Nothing is Strange" that is complete hooey! Everything in this book is strange, I really need to start reading the back of books before I start them, just to give myself a bit of warning for what I'm getting myself into. And scones... yes you heard me, scones! Nothing is Strange is an illicit, dairy-based love affair between synthetic dreams and the sensors and nerves of your eyes. It is nutritious but decadent written chocolate. Unfortunately, it isn’t possible to concentrate paper and idea into a human, for this would be the most intriguing one to chat with. But being your typical homunculus, it would probably be flawed somewhere vital and mope about mourning its own existence for always, and wouldn’t want to chat at all. Nothing is perfect as a short Nothing is Strange is an illicit, dairy-based love affair between synthetic dreams and the sensors and nerves of your eyes. It is nutritious but decadent written chocolate. Nothing is perfect as a short story collection could be. It molds the shapes which only exist in the act of sleep and solidifies them into a theatre of little masterpieces. Nothing is hypnotic, humorous, horrifying, and every other H word that we spit out in haste when we can’t really describe what we feel. It’s truly neapolitan, and not only because one of its stories harbors a serious ice cream fetish. I stubbornly straddled the fence on this book for awhile even though it kept popping up, and the guilt for that is real. If you’re not sure, just try a small bite. It pretty much becomes a vortex after that, and good luck running free from it. My particular favourites were “Dunce”, “Escape From the Butcher’s Shop”, “The Living Crown”, “Extraordinary Elsie” and “Stan and Stan”. Interestingly, these all stand out because they challenge the innate fatalism of people. One is not always meant to be what it seems they will at birth, even if everyone they meet says otherwise. Not when there is a whole world waiting out there whose mere touch can change anything. What a great selection of shorts. Russell works away in the background like a mystical trickster, the stories full of surreal imagery but somehow twisting them into the more plausible reading of reality. Reading this collection reminded me of those first rushes of intellectual expansion that you own as an individual, and you spend too much time conjecturing on the nature of reality and everything is mind-blowing. What if instead of this everything was this? But then this was really this! Whoah! T What a great selection of shorts. Russell works away in the background like a mystical trickster, the stories full of surreal imagery but somehow twisting them into the more plausible reading of reality. The first book I read on my Kindle. Very pleasant. This book is fascinating. Strange short stories, which I realized at some point reminded me of Indian puranas, those lovely stories of Ganesha and co. Myths, which reveal a bigger truth. I don't know if that was the goal of the author, but it is a hard one - to write contemporary myths. Or maybe one could say these stories were like zen koans a bit, to bring one to a realization. Or if you don't want to dig so deep, call them surrealist to pleas The first book I read on my Kindle. Very pleasant. This book is fascinating. Strange short stories, which I realized at some point reminded me of Indian puranas, those lovely stories of Ganesha and co. Myths, which reveal a bigger truth. I don't know if that was the goal of the author, but it is a hard one - to write contemporary myths. Or maybe one could say these stories were like zen koans a bit, to bring one to a realization. Or if you don't want to dig so deep, call them surrealist to please the western mind, as à la Borges. An enjoyable fast read. Short quirky stories of the weirdest kind. Highly entertaining. Nothing Is Strange is one of the strangest books I have ever read in my life. That is not to say it's badly written, but you truly have to suspend reality to get through most of these short stories. They are not your average plot-driven stories but a series of short, weird, snippets of strange things happening to strange people. 1. The cover image. This, in my opinion, is one of the best, most creative, and eye-catching covers I've seen on a self-published book. This should be given as Nothing Is Strange is one of the strangest books I have ever read in my life. That is not to say it's badly written, but you truly have to suspend reality to get through most of these short stories. They are not your average plot-driven stories but a series of short, weird, snippets of strange things happening to strange people. 1. The cover image. This, in my opinion, is one of the best, most creative, and eye-catching covers I've seen on a self-published book. This should be given as an example of good cover art. 2. The chapters/stories don't drag on. With a book like this, I think if they were any longer then it would become very difficult to stay interested, but the author has made it easy for even the most distractable reader to stay plugged in. 3. It delivers exactly what is promised: Strangeness. No frilly characters, no twisty complex plots. The author keeps to his quirky, oddball voice. 1. Hard to wrap your head around. While I give kudos for staying true to his vision and his voice, I personally had a hard time not finishing each chapter with complete confusion. Perhaps the author exists on a higher plane of intelligence than myself, as a great deal of truly strange people do, and there are hidden themes and meanings to each story but I couldn't decipher anything while reading. Not a good book choice for people who like cut and dry, tangible themes or plots. This is my second book by this author, the first being Strange Medicine. Both books are very similar in respect of they have short sharp story blasts of pure weird and utterly crazy brilliance. There is nothing like them, none that you could possibly say I have read something similar before, just uniqueness. It is like watching mime but in words, I just couldn’t take my eyes from the pages because I felt I would miss something if I did. Some stories are very sad, or they feel like a never-ending This is my second book by this author, the first being Strange Medicine. Both books are very similar in respect of they have short sharp story blasts of pure weird and utterly crazy brilliance. There is nothing like them, none that you could possibly say I have read something similar before, just uniqueness. It is like watching mime but in words, I just couldn’t take my eyes from the pages because I felt I would miss something if I did. Some stories are very sad, or they feel like a never-ending circle that you know will just go on after you leave, because although they are only a few pages long you don’t feel like the story will ended it will carry on when the words finish. The cover picture is perfect, the title brilliant and the stories truly fascinating. The thing about these stories is every person that reads them will interpret them differently. I really don’t think that there is a right or wrong way to describe them and I even feel that I could read them another day and see a different story in them all again depending on my own mood at the time. It makes them personal to me. Of course I have my favourite. The Meeting. Don't believe the title. In this book, EVERYTHING is strange. And it's absolutely marvelous. A collection of very short stories by Mike Russell, Everything Is Strange comes across as a kind of mix of Black Mirror and The Twilight Zone, but still something else altogether. In my experience, writing a weird story isn't all that difficult. Just throw a bunch of things that don't make sense together and create a narrative. But what IS difficult, and what Russell does with aplomb, is to create strang Don't believe the title. In this book, EVERYTHING is strange. And it's absolutely marvelous. A collection of very short stories by Mike Russell, Everything Is Strange comes across as a kind of mix of Black Mirror and The Twilight Zone, but still something else altogether. In my experience, writing a weird story isn't all that difficult. Just throw a bunch of things that don't make sense together and create a narrative. But what IS difficult, and what Russell does with aplomb, is to create strange stories where nothing really quite makes sense ... and turn those stories into narratives that hold a much deeper meaning than simply what happens on the page. These are surrealistic think-pieces. And they'll take you to wholly new places, where the absurd is the ordinary, and self-discovery is just one oddity away. I'm not going to synopsize any of these, as they're all so short that to do so would be to spoil them. But what I can say is this: This book is absolutely worth picking up. As each story stands on its own, it's a great collection to pick up for a bit of in-between reading - though I often found myself sitting down and cranking through several stories at a single read. Contrary to the title, in Russell's world everything is strange. But it's also extremely realistic, when you really dig into the heart of the matters being discussed. A wonderful exploration of our reality through dream and metaphor, I can't recommend this collection enough. Reader Beware: If you enjoy reading stories that are written with structure, stories that are comprised of a beginning, middle, and end, or stories that do not transcend the boundaries of reality, then this book is not for you. If, on the other hand, you want to read stories that will free you from the chains that are attached to the anchor of reality, then this is your must-read collection. Nothing is Strange is a collection of twenty short stories in which everything is strange, but strange in Reader Beware: If you enjoy reading stories that are written with structure, stories that are comprised of a beginning, middle, and end, or stories that do not transcend the boundaries of reality, then this book is not for you. If, on the other hand, you want to read stories that will free you from the chains that are attached to the anchor of reality, then this is your must-read collection. The concept of these stories first appears to be too simple to be called art. Yet, as one delves into the collection, and crosses back and forth between the boundaries of real and unreal, one comes away with the feeling that there is more to them than at first appears - and you would be correct in this assumption. But the magic doesn't end there, for once discovered and devoured, the effects of a surreal adventure multiplies the further out one travels. So go ahead: Jump into the swimming pool with your clothes on. You may very well find you won’t want to get out of the water. This book is filled with stories will make your mind race, and think amazing thoughts. I've read it multiple times and made my friends read some of my favorite stories. If you want to read well-written short stories and as a bonus get to see the world in a different light read this book. Weird and bizarre stories that are strangely compelling - I'm sure that they wont be to everyone's taste but I really enjoyed reading something that was completely different and which stretched and twisted the old brain cells. If you want to read a book outside of your comfort zone, this might be the one for you. Nothing is Strange are short stories, some only a couple of pages long, that are surreal and quite absurd. Yet they hit home with me and I absolutely loved them. Very, very unusual to read, I mean, I've never come across a story about humans with key holes and plugs, yet this one was a favourite of mine. The protagonist was born in a butcher's shop and manages to escape. He walks around town and everyone he meets has a keyhole with a plug, aside from one lady who has a bright light emanating from her keyhole. He wants the key to all the key holes; he wants to escape. She makes him see that everything is an illusion and all he needs to do to escape is look through his own keyhole. We can interpret this in so many ways. Is it about freedom? Not being trapped? Trapped in life? In our desires? Do we need to question oppressive ideas? Where do these ideas come from? I would like to see it as we are all free and able to do what we please and have free thought, as long as we believe we can. Liberating right? A wonderful feast of deliciously bizzare stories that had me hooked from cover to cover. This book is hallucinogenic.Twenty short stories, one more surreal and thought provoking than the other. I loved everything about it and the book cover is just perfectly designed for it. Once again I swan dive into the depths of the strange and alluring world of Mike Russell. I chat with satisfaction, have a little dance with paranoia and dine with diversity over a roof top view of the universe. Prepare to have you mind blown, literally. You will find pieces of your brain scattered beautifully upon the page. It’s quite liberating, to expand the mind and turn those cogs manually for once. To see behind the facade of everyday life, ask those questions and open Pandora’s box. Thank you to the amazing people at Strangebooks for this opportunity to review Nothing is Strange by Mike Russell. As always it is a pleasure to work with such a bunch of talented people. Hats off to you. Seriously, if you haven't checked them out you should. Discover a strange and enchanting world and steel yourself to look through the keyhole. 20 extraordinary short stories await you in Nothing Is Strange. Be prepared for the odd and unusual, this material is not for the faint at heart. Dare you read on dear reader? Russell’s writing style reminds me in ways of H. P. Lovecraft, unique and hypnotic. There are times you want to look away but can’t. Similar to when you have a scab, you know you shouldn’t pick at it but you find yourself making it bleed until it scabs over again thus beginning an endless loop. You are creating your own vicious cycle until you break the chain and ask yourself why you ever did that. Why did you deliberately make yourself bleed when you knew of the consequence? You know the answer so why ask the question? This, ladies and gentlemen is the crux of the matter. What I like about Russell’s style of writing is that it is thought-provoking. It makes you ask yourself a lot of questions; let’s throw away those rose-tinted glasses shall we folks and take a good hard look at reality and beyond. In ways it’s reminiscent of that feeling of being tipsy. A good and happy feeling in my personal opinion. Can you get drunk from reading? Is it possible to pick up a tasty liqueur of fine creativity from your local supermarket on a Friday night? Russell’s writing is similar to that, knowledgeable and comforting. The world makes sense all of a sudden and things slot into place. You wonder why you have never seen it like this before, that it is all so simple. A lightbulb moment forever frozen in time where you are looking down on yourself and finally making sense of the world. Drink anyone? I give this book a five out of five star rating. It was the perfect wine to savour after my three course meal. Think I will have another glass, make that a bottle! Cheers! Don't forget to check out StrangBooks and grab yourself a new fascinating read! Superb collection of surreal stories challenging the concepts of reality, existence and perception. Mike Russell has a delicious imagination that moves fluidly and unexpectedly in all directions. Recommend for lovers of anything surreal or readers who enjoy pushing the limits of the possible. I won this book in a giveaway. I was excited to read it. I got through it pretty quick. It was such a delight to read! Every story was unique and at the end of each one I thought "What the F..." in a good way! Nothing Is Strange by Mike Russell is a collection of 20 short stories, spanning various genres, but all sit under the roof of strangeness. Don't let the title of the book fool you. "The Diaries of Sun City" is one of the most enjoyable pieces in the collection. It is about a man, name unknown, in the world of Sun City, where everyone keeps a diary, except him (/her). When the speaker buys a diary, they discover that the pages written at night disappear by morning. The ending is beautiful. "Dunce" is a sad but emotional five-star story. I can't describe it but will only use one of the quotes at the end. "I think that the tears I am crying now are the same as those. I didn't understand what was going on in the theatre and I didn't understand what was going on when the cone fell on her. I think that maybe we only cry because we don't understand what is going on. Maybe if we understood what is really going on we wouldn't cry at all, ever." Though mostly strange, many of the stories are fun and some are deep, philosophical even, although the ending of several stories had me puzzled or surprised. Of course, as is the case with short story collections, some pieces did not appeal to me. However, not all of those I have not mentioned here, I disliked. They are after all 20 short stories. "The Miracle" is a glum but interesting story. For me, I felt it was a reflection of the state of indifference and coldness that many people are now in, whether regarding general accidents or on a broader scale, war. "Escape from the Butcher's Shop" was a bit odd for me; however, it tackles the idea of confinement both physically and within a person's mind. It shows how people often confine themselves and are unable to see beyond their own knowledge and/or beliefs. "Extraordinary Elsie" is just weird. However, it reminded me of Samuel Beckett's Waiting for Godot , while taking the waiting part to a whole new level. "Mask Man" is a five-star story. I simply loved it, although I thought it was a bit scary at some point. It falls under the paranormal genre and was a good read. Another five-star story was "The Unnameable Made Flesh," which – though in line with all the strangeness of the collection – was powerful and tackled a bit of politics and government oppression. Similarly, was "The Living Crown" . I loved that one, which handles both government and self-oppression. "Stan and Stan" is reminiscent of Oscar Wilde's The Picture of Dorian Grey. Other recommended stories in Nothing Is Strange include: "Barry and the Triplets" and "The Shining Flower" . While I can't say I have understood all of Mike Russell's stories, I can say that I have enjoyed reading many of them. Nothing Is Strange makes odd, weird and strange lift their caps, and bow in astonishment. Note: I received a free copy of Nothing Is Strange from the author/publisher in exchange for an honest review. It’s a collection of 20 short stories where everything is strange although the title says different. My first idea was to read 2-3 stories a day in between my work to escape reality but that didn’t happen bec "I received digital copy of this book from the author in exchange for an honest review"
Have you seen those short cartoons that intermittently pop up in the midst of a Monty Python's Flying Circus sketch? This book is like a collection of those... in book form. Nothing is Strange is an odd little slice of life wrapped up in 20 short stories from a very creative author. From the immensely baffling to the barely off-kilter, this book has a little bit of something for everyone. My personal favorites of the stories bordered on the strange, without taking the full leap off the cliff. I Have you seen those short cartoons that intermittently pop up in the midst of a Monty Python's Flying Circus sketch? This book is like a collection of those... in book form. Nothing is Strange is an odd little slice of life wrapped up in 20 short stories from a very creative author. From the immensely baffling to the barely off-kilter, this book has a little bit of something for everyone. My personal favorites of the stories bordered on the strange, without taking the full leap off the cliff. I absolutely loved "The Diaries of Sun City" and "The Meeting." I'll admit, a few of the stories left me scratching my head (Especially the first story, "Cream Tea") and thinking about them long after I tried to close my eyes for the night, but then again, I tend to like things like that. If you don't, however, this may not be the book for you. Nothing is Strange is certainly a very strange book, and I loved it. Mike Russell has created a very unique book. Never in my life have I read something like this before. The book covers current important topics, in each of the twenty short stories, in an imaginative way. Nothing is Strange is a quick and enjoyable read. 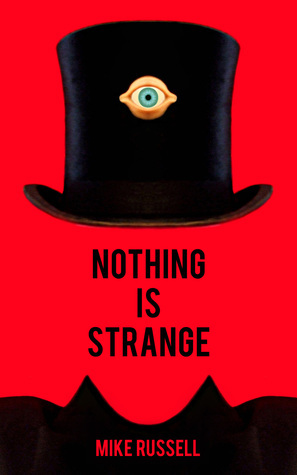 However, I would not suggest this book to people who like to keep things simple and structured; but if you like books that are weird and make you think then this is the book for Nothing is Strange is certainly a very strange book, and I loved it. Mike Russell has created a very unique book. Never in my life have I read something like this before. A euphoric mix of fantastical, magical, disturbingly funny tales that challenge your view of reality. You'll lose yourself in a world that will make you question whether up is left and left is backwards. Where dreams may be reality and reality ceases to exist. So take a break from your boring world and jump into this one where reality is but a ghost. Mike Russell is a British author best known for his books 'Nothing Is Strange', 'Strange Medicine', and 'Strungballs'. Mike Russell's latest book 'Strange Secrets' is now available. Mike Russell was born in 1973. He grew up in the small village of Pulborough in the south of England. As a child, he enjoyed daydreaming, art and writing strange stories. As an adult, he enjoys daydreaming, art and writ Mike Russell is a British author best known for his books 'Nothing Is Strange', 'Strange Medicine', and 'Strungballs'. Mike Russell's latest book 'Strange Secrets' is now available. “Dunce is completely bald and has a really pointed head so the temptation to get him paralytic on his thirtieth birthday, carry him to the tattooist’s and get a nice big ‘D’ smack bang in the middle of his forehead was too much for me. Trouble is he can’t afford to have it removed so he wears a big plaster over it. Gangs of children tease him.